It’s the end of August people! We are in the summer season home stretch, so I don’t know about you, but I’m trying to squeeze every last drop out of the summer that I possibly can! I’m shopping for the late summer seasonal fruits and vegetables- NJ tomatoes, squash, zucchini, eggplants, peaches, nectarines, plums and other stone fruits. These vegetables and fruits are at their peak right now and at their most delicious. Really, how many times throughout the year have you purchased tomatoes in particular, bring them home and these hothouse versions of the fruit have ZERO flavor? I feel like I’m not eating a tomato, I’m eating a piece of cardboard! SO, now is the time to take advantage of beautiful, ripe, juicy tomatoes, bright in flavor and color that are fragrant and taste EXACTLY how a tomato should taste! Make some sauce, freeze it or make a savory tomato relish and save it to enjoy well into the fall. BUT, for right now, my mind is on minimal cook time (still!) with simple, beautiful ingredients that provide optimum flavor. Let’s close our eyes and pretend we are in the Amalfi Coast, do it with me…. One favorite side of mine is the Caprese or “three-color” salad- it’s simple, fresh, easy and makes a beautiful presentation as a side to ANY dish. Pick up some fresh salted mozzarella (at Top Tomato) slice it up, buy some vine-ripe or beefsteak tomatoes, assemble on a plate, drizzle with olive oil & balsamic or red wine vinegar (your preference) season with salt & pepper (generously) and chiffonade some basil. You an also add extras like tapenade, kalamata or regular black olives, toasted pine nuts (in a dry pan) & shaved or chunked parmesan. Chiffonading your basil is an easy way to add elegance to your dish. Simply stack a few basil leaves, roll into a tight cigar shape and slice thinly across. Voila! I don’t think any instruction is required of the above, right? Just slice, arrange, drizzle, enjoy! One thing worth noting- if you do happen to get some STILL flavorless tomatoes, slice them up and season them with sea salt & pepper which will draw some of the moisture out and give them extra SABOR! Another easy side dish I love for the summer is a ribboned zucchini crudo (raw) salad. Using a mandoline or simple vegetable peeler, you can transform your zucchini into something that you might see at a fancy restaurant. In fact, the first time I decided to make this salad, I was inspired by a French provencal version I had had at a fancy dinner party in Millbrook, NY (NO, it wasn’t Martha’s Stewart’s house, BUT close enough!) There are so many ways to vary this salad- you can add pine nuts, or walnuts, feta cheese or parmesan. It would be lovely with fresh mint OR basil, a little lemon zest, maybe some olives or capers as well, use whatever you have in your home! This salad is fresh, healthy and impressive (should you have guests over). Cut zucchini lengthwise into 1/8-inch-thick slices with slicer or a vegetable peeler or your Benriner and transfer to a colander set over a bowl. Sprinkle zucchini with salt and toss to coat (you are essentially drawing some of the extra moisture out) Let stand 5 minutes, then rinse under cold running water. Transfer zucchini to a clean kitchen towel and spread in 1 layer, then gently roll up towel to absorb excess water and let stand 5 minutes more. Whisk together your dressing- oil, zest, juice, mustard and pepper in a large bowl until combined. Add zucchini, cheese, herbs, olives and toss to coat. FINALLY, I’m going to try and sell you on the virtue and extols of a roasted red pepper salad. If you haven’t tried this at home and have only relied on roasted red peppers out of a jar, you are truly missing out! While pepper season is on the horizon (Fall), the freshness of this salad is right in keeping with my palate pleasing summer salad choices and is ALL around excellent. My mother used to make her own roasted peppers constantly when I was growing up- she preferred her version extremely HEAVY on the garlic, but she is a Spaniard and garlic is to a Spaniard what heroin is to an addict. Any opportunity to eat a roasted vegetable with garlic and olive oil, sopped up on a piece of crusty bread they love…but I digress. It IS a great salad though and personally I love the experience of peeling away the charred bits of pepper after they have roasted and steamed- its kind of like peeling away the Elmer’s glue off of your hands as a child. There is some controversy regarding broiler usage and whether or not you should keep you oven door open to allow some of the heat to escape. I’ve heard this produces even roasting temperatures as opposed to increased continual rising heat, but I’m asking you to check your oven instructions, as I’ve ALSO heard of people melting their stove top knobs off of their ovens (that’s no good!) BUT always remember to keep an eye on any food you might be broiling as it can quickly go from roasted to CHARRED! While the peppers are steaming, post roasting you can work on other elements of your dinner OR you can make this salad first, throw it in the fridge and really allow the flavors to marinate. Heat broiler with rack in top position. With bell peppers on a foil rimmed baking sheet, broil the peppers, turning occasionally until charred on all sides and tender, about 10 minutes. After broiled, transfer peppers to a bowl and cover tightly with plastic wrap, allowing to sit & steam for about 20 minutes. After steaming, remove the skins from the peppers. Usually I just peel the skins off, but if you are having trouble try rubbing them with a dry paper towel. Stem, seed and cut each pepper into strips. Arrange your peppers on a serving tray and drizzle with olive oil and vinegar, topping with olives, capers, lemon zest and basil. Season with salt & pepper to taste. Enjoy your salads and the rest of your summer, we’ve only got a few weeks left of this bliss! After over half a day of touring the Residenz I was ready for some food. The Viktualienmarkt- Munich’s oldest outdoor market (since 1807) has over 140 market stalls selling everything from fresh fruits, flowers & spices, regional specialties like wursts, schnaps, honey, pretzels and of course serves as biergarten which unfortunately is late to open at 9AM!! So at 9:02 you can roll up to the beer shack where all the bier is poured out from the barrels and you grab how ever many half liter or full liter mugs that you want! It’s quick, quick, quick just get your bier and go sit at one of the communal or highboy tables! Of course after I had gotten my biers a tour bus of American students pulled up outside the Viktualienmarkt, their occupants heading straight to the bier line, these kids clearly taking advantage the lowered legal age for drinking in Germany (drinking at 14 with a parent, 16 without!) Students aside, the Maypole was beautiful in the center of the square and I got myself and nice salty pretzel to go with my bier & some wursts and all was right with the world. I did a few laps around the market, and left with some assorted German schnaps- in raspberry, peach, pear, cherry and a spice blend. This is the thing with German schnaps, they are sugar free- really just a distilled alcohol infused with fruit or spices or roots. Therefore they are EXTREMELY strong 35% volume and UP, and therefore go down like paint thinner burning your throat! People down these after meals in Germany like nobody’s business but unfortunately, I couldn’t do it! I’m a lightweight! So, I’m trying to figure out ways of mixing what I brought home. I’m determined to make it work. After my day was said and done, my body was straight up hurting form all the walking around. Even with my most comfortable pair of shoes, my feet still hurt. So I made it a point to pick up some nice German badesalz (bath salts) from the local Apotheke and gave myself a much needed hot soak back at the hotel. After that I felt somewhat renewed and hungry, so I sought out an option close to my hotel which was located in the center of the city anyway, so there were lots of options. Knowing that I wouldn’t be eating typical Bavarian for the latter half of the week, I wanted to get it all in for the first half! The Beim Sedlmayr fit the bill. The seating was beer hall style with long communal tables and the restaurant is a local favorite, so I plopped myself towards the back giving me a full view of the place. Beim Sedlmayr is known for it’s schnitzel and its sour calf kidneys or pickled pigs feet, but I of course I went straight for the wienerschnitzel- it was pounded thin and fried to perfection, not heavy or oily with a slice of fresh lemon. SO good. Served with a side of german potato/apple salad and a weissbier, it was fantastic. For the next day I decided I was taking a trip OUT of Munich and towards Austria to visit Bavaria’s most iconic castles Schloss Neuschawanstein & Hohenschwangau. The first being the iconic home built by the wildly eccentric “Mad” King Ludwig II and the latter being the summer home he grew up in with his father King Maximilian II. There are many aspects of King Ludwig’s life that were debated, whether he was actually mad or not, (the consensus is that he was not, but rather the victim of a plot to dethrone him), his sexual orientation, many believe he was likely gay and involved romantically at some point with the composer Wilhelm Richard Wagner. Ludwig II was reclusive, choosing to leave miles away from Munich and the circumstances surrounding his death are still disputed and investigated (was he shot or drowned?) So, theories aside, Schloss Neuschawanstein is every notion you might have in your head of what a fairytale castle SHOULD look like. If you get into specifics, the Cinderella castle in Disney World was inspired by this castle. Built into the side of a mountain overlooking beautiful rolling hills, lakes and valleys it honestly was ALL the magic I needed right then and there. The weather was perfect and it provided a deep blue backdrop that just enhanced the overall experience. It took over 23 years to build the castle and Ludwig II spent so much money on its construction that he died with so much debt, the castle was immediately opened to the public as a tourist destination to help repay what was owed. The trip was about an hour and a half outside of Munich and after touring two castles I got back to Munich at around 8pm having to attend a work function at 9 & that’s when the magic stopped! Well, work WAS the purpose of this trip. Since I had a media event at the Mandarin Oriental hotel the next day, I was pleased to find it overlooked the bier garten of the iconic Hofbrauhaus so I got to listen to Bavarian music throughout the day as smell of crispy pig knuckles wafted up. Hofbrauhaus, Munich’s oldest brewery was built in 1607 at the order of King Maximilian I so that he had his favorite wheat bier within close range of the Residenz. Maximilian I was a known gourmet and he demanded the white bier be produced over the heavey “brown barley ale” that was typical of the time. 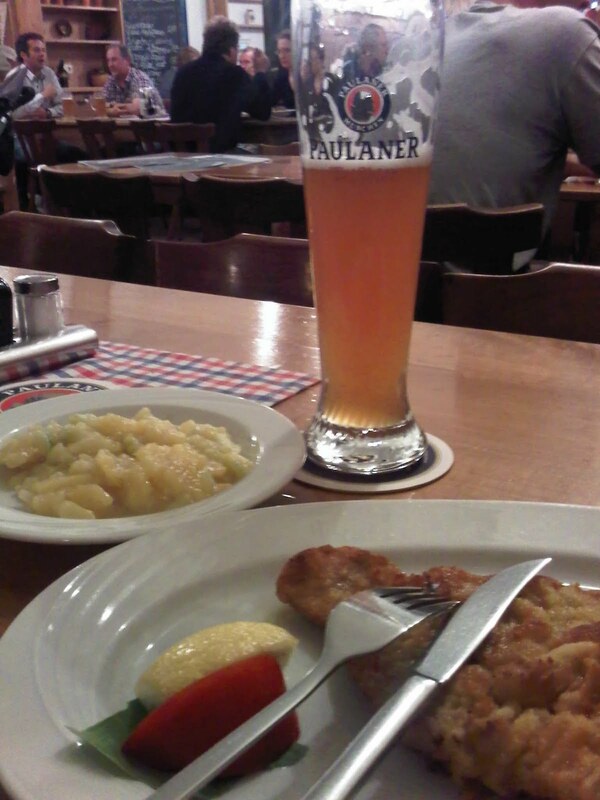 Luckily I was able to make a lunch stop at Hofbrauhaus in between appointments. If you want a similar experience go check out the newly opened Hofbrauhaus in NYC on Third Avenue- I haven’t been there yet, but I hear its fun. Another stop worth noting, also within range of the Residenz is the gourmet store, Alois Dallmayr. Over three centuries old, (est. 1700) Dallmayr used to serve as the official supplier of food items to the Royal Bavarian Court. Now, Dallmayr is the producer of some of the finest food items in Germany, with gourmet coffee being one of their main commodities. I bought several items to take home with me from Dallmayr, pistachio honey, some liquors, cookies and candies which didn’t even make it home with me. Dallmayr has this great old world hand crafted aesthetic coupled with a beautiful traditional German feeling. The store had a huge selection of alcohols, dessert items, candies, artisanal sausages, speck, honey and jams. There is a dining area upstairs that offers food made with Dallmayr ingredients and of course there are a few other dining areas for a quick in and out snack or drink. To me it has a VERY similar layout and feel as Mario Batali’s Eataly in NYC. Dallymayr and everything in Germany was just fantastic. I enjoyed my trip thoroughly and recommend the city/country to anyone who might be considering a trip to Europe. You can only hope the weather is good when you go! Leaving New York City in the middle of a heat wave (temps reached 105), I was screaming to visit a place that was cool and rainy, so I packed up my coats, tights and closed toe shoes and embarked on my Bavarian adventure. I arrived in Munich on Sunday and stepped out of the cab to a lovely 55 degree temperature – it felt like fall and was a welcome respite from the heat and humidity I had just left behind in New York. My hotel was located near the town square in Munich, the Marienplatz- the center and heart of the city was just a few blocks away. So after a nice nap, I woke up feeling refreshed and ready to start to get to know the area. Since my hotel wasn’t an American Marriott or Hilton, the reception had little to offer me in terms of directive other than “make a right, THEN make another right”. Thanks. Luckily I always travel prepared, with guides and maps! So, that night I walked and walked and walked some more. In a few hours I saw the famed Glockenspiel, the Baroque Theatinerkirche, the Felderrnhalle and a few other churches in the Marienplatz area. Since it was Sunday, the majority of people that out & about were locals taking a leisurely stroll- so it wasn’t as crowded and all the beautiful churches were open to the public. At around 7-8 after all that walking, I needed a meal. The nearby Nurnberger Bratwurst Glockl am Dom fit the bill- traditional Bavarian food served in a traditional setting, a restaurant that first opened in 1893 across from the Frauenkirche (the largest Gothic church in Southern Germany). The meals were all served on tin plates, the atmosphere was warm and typically German with cuckoo clocks, heavy furniture, wood paneled walls, bier barrels in the back and prints from Albrecht Durer on the already picture heavy walls. Warm fresh pretzels are a given on every table and my crispy pork came with a veal meatball, potato dumpling and a lovely potato, cucumber, apple salad that I of course complimented with a half liter of the house bier. I finished off my meal with the lightest apple strudel which wasn’t what you would imagine a strudel to be- since the apple was layered, cut paper thin, more like a piece of pie and coupled with the MOST amazing warm vanilla sauce. I left loosening my belt and ready for a good night’s sleep. My plan for the next day was the hit the historic Residenz. Originally a moated castle (1385), it was eventually made in an extensive complex with seven courtyards which served as the home of multiple generations of Bavaria’s famed Wittelsbach dynasty. MASSIVE in structure, I was told to devote at least a half a day to touring the facility in its entirety. In addition to something over 160 rooms, the Antiquarium, a 225 barrel vault housed frescoes, grotesques and other embellishments was a must to be seen, as was the Cuvillies Theater (the royal theater) in all of its Rococo glory, the Treasury (where all the royal jewels and crowns were held), the Ancestral Galley, chapels and halls. Honestly I could have stayed at the Residenz ALL day, it was beautiful, impressive and sometimes unbelievable. In some rooms it looked like Liberace had thrown up gold leaf all over it, but I wouldn’t expect anything less from a royal residence! The royal jewels were unbelievable, a testament to the gross amount of wealth these families had. I emerged from the Residenz rubbing my eyes and in need of a good meal. Part two of my day was reserved for the Viktualienmarkt an outdoor food market and bier garden established in 1807—I was ready for a few pints to be sure!